I've just been so very busy with everything. So, first off: work. I've continued working my day-job almost full-time, and that has reflected on the amount of free time I have. On the weekdays I never have the time nor the energy for anything productive, and weekends must be shared with everything else. Other ways of sharing data? Service instance pooling, for example for database workers? How to best support asynchronity, while keeping good performance? Message queueing and buffering? Optimized data structures and piping code. Am I really going to write my Master's Thesis on this?? And as if this isn't enough, I've been FINALLY trying to up my social life. And I can say without a doubt that this has taken a considerable amount of my energy. Without giving too much back. Depressing. I've made some new friendish connections, but nothing more than that. And - again - as if I already didn't have enough things to do, I also tried making some music, as I couldn't resist getting a Novation Launchpad Pro. Another reason was that I was going to make all kinds of non-music stuff with it, but so far that has limited to making a rather simple Guild Wars 2 key mapping for it, for playing a music-themed minigame. Haven't done anything new with it lately. Then there is also another time sink. I've wanted a good video camera for a long long time for various reasons, so I finally acted on that. Got a GoPro Hero 5 and the Karma Grip. Was going to take them to a holiday trip, but the delivery dragged on and on. So no holiday video. I shot some test material with, watched a lot more in Youtube, and in the end got bit by a camera-bug. This infestation caused me to upgrade the GoPro to a Panasonic Lumix GH5 with a 20mm f1.7 lens (H-H020, the only lens that was available to ship immediately). I've had the camera for about a month now, and am in the process of getting a 12-35mm f2.8 lens (H-HSA12035), because the camera has amazing video quality, and I'd like to use it more than the 20mm allows. The only weakest point is the autofocus. But despite this I have yet again a new hobby: vlogging. I already shot and edited the pilot-episode (cooked some food) on one Saturday (took almost the whole day!). So, a lot has happened, and will continue to happen, but at a lot slower pace. At least when it comes to programming projects. I feel great sadness about this, but I guess this is called getting a life? Foreword: the new(er) HAProxy 1.5 supports map-based hosts, which are the recommended way. But here’s a guide for those of us who are stuck with the older version. So, you’ve got several application servers, with ports all over the place. How to organize this mess to be accessible more easily? By using DNS and a reverse proxy that is aware of the Host-header. HAProxy is perfect for this. High performance and low footprint. As a bonus HAProxy can also be configured to terminate HTTPS requests so that even your dumbest services can benefit from encryption! Enable; to mark that you’ve actually edited the configuration, go to /etc/default/haproxy and set ENABLED=1. And that is it! Now you have a basic HAProxy installation that reverse proxies requests to two different hosts/ports based on the Host-header. Simply add more backends and acl/use_proxy combos to introduce new services. But the fun doesn’t end here! Now you have a bunch of backend servers whose requests are all originating from a simple host, and that breaks ACLs and logging and everything! To fix this you’ll have to go manually through each and every service and make the necessary configurations. For example, to make HFS to trust the X-Forwarded-From header set by HAProxy, you’ll have to edit its configuration file manually, as per this guide. For Apache there exists a whole module for this: mod_remoteip. Simply include the module and set RemoteIPHeader X-Forwarded-For and RemoteIPInternalProxy proxy_ip_here. You may also need to change %h to %a in LogFormat to get the logging to work correctly. No matter what you are using, the common thing is to mark your proxy machine as trusted, so that the real remote IP can be read from the header. Be aware that the header contains a comma separated list of proxies(or just multiple consecutive headers of the same name), and the last one is your proxy. The rest can be freely set by the client, and can not be trusted. This post ended up taking a lot longer to write and in the process turned up a lot longer than I first anticipated. And I still feel this everything that could be said(and nor was the previous part). Most of this was written in the immediate days after the release of the final episode and most of the editing was done by the end of that week. Afterwards it still took few extra weeks to recover enough to even be able to get everything together and add some missing observations. But to get on with this: first some initial thoughts about the final episode. I’ll try to be vague; there shouldn’t be any spoilers. These thoughts are complemented with some self-reflection. While the final episode was enjoyable, it lacked some of the magic all the previous episodes had. I don’t know if it was because of the fact that I wasn’t still done processing the previous episodes, or the fact that I had so much other stuff distracting me in real life. In any case I felt slightly disconnected. Or maybe it was the fact that the episode was more action-oriented where the previous episodes were more dialog-oriented. Also, with so many different locations and quick transitions between them the episode felt a bit rushed. But then again, it’s also about how you view the thing. Squeezing together tons of different fan theories(intentional or not) and sensibly finishing a time travel story is definitely not easy. After watching the credits I still had to spend maybe five minutes just staring at the main menu listening to the music, not really comprehending what had happened nor that the game really was over. As above - and like I so subtly hinted in the previous part - Life is Strange touched me with an unexpected intensity. Partly because of the game itself(the story, the characters and the atmosphere) and partly because of how it led to some pretty major self-reflection. First about the game itself. And while that everything was.. everything, it also was almost too much. And now the end is here and I feel empty. The closure wasn’t what I was expecting, nor was it was I was hoping. Instead, it was what I needed. While the endings left A LOT open, they also had an adequate amount of closure to keep me from totally collapsing. This allowed me to limp to the game’s reddit community, where the feelings could be shared. Thank you all. In addition, after I had played the episodes 3&4 that I discussed in the previous post, I listened to PSNStores podcasts about those episodes. This helped me a great deal in processing what happened with those episodes. The more time I spent reading reddit and watching interviews, the better I finally felt. Now that I’m writing this particular paragraph weeks later, I’m almost completely at ease with everything. I’ve had time to research how the final episodes, and in particular the ending, is supposed to be understood. As the game’s developers have told in many occasions, the game was about the personal growth of Max. A nostalgic coming-of-age story. This is a crucial cornerstone to understand. The relations between characters were crafted to be so perfect and special. For example Chloe was crafted to be THE perfect friend with a deep emotional connection with Max / the player, evoking a longing for such a person in real life. But real life does not work this way. It just doesn’t. To adequately process coming-of-age stories, there needs to be some reflection on one’s own life. This is the part that most definitely changed me. Some details below, but the gist of it is that while affecting (at least in the short term) on how I see the world, this experience also made me realize certain rather grander / fundamental things about life. Life is so weird. In the end you’ll feel weird and dull, but also oddly at ease: there is nothing you can do now. I’ll never forget the journey, or how it helped me grow. As the game and the setting were so greatly crafted, it was really easy to actually become Max, not just be someone who control’s her avatar. Not many games can accomplish this. Almost without noticing it I had slipped to be in the wonderful nostalgia-colored teenage-life of Maxine Caulfield. This glimpse to another life. Life of an adorable, slightly geeky girl who likes photography and innocently loves to observe the world. But you can’t change your life just like that; I am not Max, nor is her life mine. No matter how much I hoped to be Max, it was not going to happen. But you can try to slowly change yourself. My immediate reaction to this was of course to try and be more like Max, try to observe the world with that same kind of non-judging, all-seeing way. But it’s not that easy. While being bit of a stretch, I do have moments when I feel emotions somewhat comparable to hers. Not everything is perfect, but I’m pretty good in what I do and how I have my future planned. I do have the occasional moments of feeling great in life. While not happening too often, I’ve also had some good moments with friends. I should just embrace who I am, no matter what. And you don’t actually need to have an opinion on everything, just keep an open view on the world. Don’t just plod through everything without taking a moment to appreciate what you are doing. Do this and maybe you’ll end up more like Max. More like a better person. And don’t try to necessarily change the world, change your view on it. Having continued on this path of self-reflection were are now arriving at the very core. This experience has finally had me realize that there is multiple layers(or segments or whatever to call them) of me. Sure, layering is a known psychological theory, but I didn’t realize just how accurate it was and that I too implemented it. There are those layers I show at work or when studying. I know it’s necessary to have some emotional separation, but that also makes be feel incomplete. And then there is that one layer at the core was affected by all this. Maybe that is the real me? I’ve been under a lot of stress this semester, and as a coping mechanism I’ve had to segment myself to multiple distinct though-spheres(wtf is that word). Sure there is some crosstalk, but it has stayed low. While this has helped me to focus on the task at hand, I’ve began to feel the wearing effects of maintaining that emotional isolation. There’s always been those segments, but lately they have been even more isolated. The pressure building up. The outer layer is divided to two distinct things. There is one me for studying and another one for work. Protected by those there is the normal me for friends, gaming and living in general. But that is not everything. There have been occasional hints about an isolated layer below, but nothing really concrete. But now this game pierced through all those layers and exposed that very core underneath, the ‘real me’ - or at least as real as it can get. There was a reason that core was isolated. It’s sensitive. And this game was . It cracked that isolation up. I’m in ruins. I’ve tried to keep everything from imploding, but it has not been easy. Maybe the game was an escape? I’m actually having difficulty finalizing this section, as that would mean I accept all this. I don’t know how I would have fared had I not had an almost perfectly timed semester break this week. I still went to work, but didn’t have to worry about exercises and lectures. Instead I had time to focus on all of this: process everything(or as much as I could/can) and stumble for closure. Like a comment in reddit said, it makes no logical sense for a video game or fictional characters to evoke this much emotion. But this is art, and art is supposed to have some type of an effect. A story first, skip ahead for the actual review. Not long after the game's initial release I picked up the first episode and was immediately hooked. Played through it in a weekend, and then for a second time with different choices. I immersed myself completely into the world and story, and it was intense. Couldn't even think about playing another episode for a whole week. It actually took well over a month before I could play the second episode. And the second episode was even better. Now I had to take an even longer break. When I finally resumed playing, both ep3 and ep4 were out, and ep5 just two weeks away. I tried to pace myself by just playing ep3 during one weekend, and then ep4 the next. I failed. Ended up playing ep3 in a single day. And because it ended with such a cliffhanger I just had to play ep4 the next day. That was a dire mistake. Now I'm broken and feel empty and hollow. Couldn't even function properly for the rest of the day(or the next). This game is larger than life. The game's protagonist is a photographer, and through her eyes it is seen how vibrant and colorful the world actually is. The atmosphere is truly captivating and full of wonder, and the plot something unexpected. It took a long time to quantify, but I finally figured out why the game resonated so strongly with me. My life is quite dull and boring, and immersing myself completely to the game world and its characters allowed me to break free from that grayness, and experience the full spectrum of the shades that is life. There is also the role playing aspect. I'm normally not that social. I stick to the routine and am quite cautious on trying out new things. But the game's protagonist is social. Routine is broken by the unfolding events and that leads to trying out new things. Even the character interactions allow for experimentation thanks to the rewind ability. This all is so much more than the gray ordinariness of (my) real life. The withdrawals from stopping playing are real and hit me hard. Combine this with an awesome plot that you can influence in a real way. Add a setting that allows to partly (re? )live what I kinda missed growing up. And finally add the very likeable protagonist, a great selection of songs and the very fitting and beautiful graphics(and not a single problem with performance). 6/5. Will play again - when I recover. Sometimes going out for just a walk isn’t that easy and some extra motivation is needed. 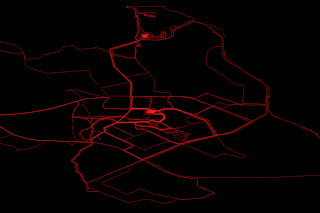 Luckily I had just that extra: going for a walk allowed me to get some rather important real-world data for the GPS tracking service I have been working for quite some time. During those walks I had the idea to further use the recorded data. The forest was filled with paths and I thought it’d be great to map those. 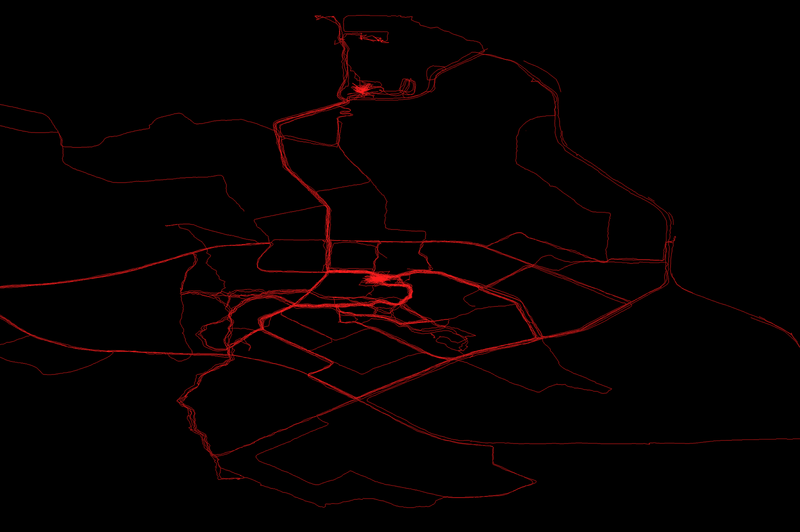 And maybe even have some kind of heatmap of the most traveled routes!